The middle part of the twentieth century was an era of great upheaval in American society. Military actions, political events, economic fluctuations, and the expansion of civil rights on the basis of both gender and ethnicity all stirred uncertainty and anxiety among the American people. One notable source of anxiety was the rise of militancy within the civil rights movement, as many activists turned away from nonviolence and towards the black nationalist and black power movements. In the 1950s, the perspectives and experiences of black men who served in World War II greatly influenced the direction of the modern civil rights movement. For returning veterans, the experience of fighting for freedom abroad made the denial of freedom at home untenable and inspired new civil rights activism. But while membership in associations like the National Association for the Advancement of Colored People (NAACP) and Student Nonviolent Coordinating Committee (SNCC) surged along with the desire to facilitate social change, some perceived these institutions as working in service of black elites and even whites and were disheartened by the lack of progress towards equal rights. For many blacks, particularly working-class African Americans, traditional non-violent protests would not suffice and instead, many turned towards tactics used during their service to advance more militant civil rights campaigns. Black militancy in turn gave rise to the black nationalist and black power movements, intertwined ideologies that encouraged African Americans to take pride in their culture and seize power for themselves rather than relying on whites and white institutions. Ethnic unity was vital to this philosophy, particularly in the face of a cohesive white majority, and the movement radically altered attitudes across the color spectrum by enhancing cultural pride and changing many whites’ perceptions of African Americans. In the 1950s and ‘60s, as black militancy was gaining popularity, many African Americans also turned to Islam. As historian C. Eric Lincoln observes, black Americans who ascribed to Islam adapted the traditional spelling from “Moslem” to “Muslim” (Lincoln, p. xi) in order to separate themselves from European and Arab Islamic sects. In communities across the United States, the movement toward Islam signified a return to the African heritage and glorified black culture in the face of perceived white oppression. Many black Muslims advocated a complete break from the white community in favor of an independent black economy built on businesses that served African Americans. Such an economy was to be a movement that began at the bottom of society and worked its way up, ultimately disrupting the status quo and improving the living conditions of the underprivileged masses. The black Muslim movement often highlighted uncomfortable truths about racial and economic disparities that neither whites nor many non-Muslim middle- and upper-class blacks wanted to face. Accordingly, the movement stirred discomfort in many sectors of American life and black Muslims were frequently ignored or forcibly relegated to the fringes of society. 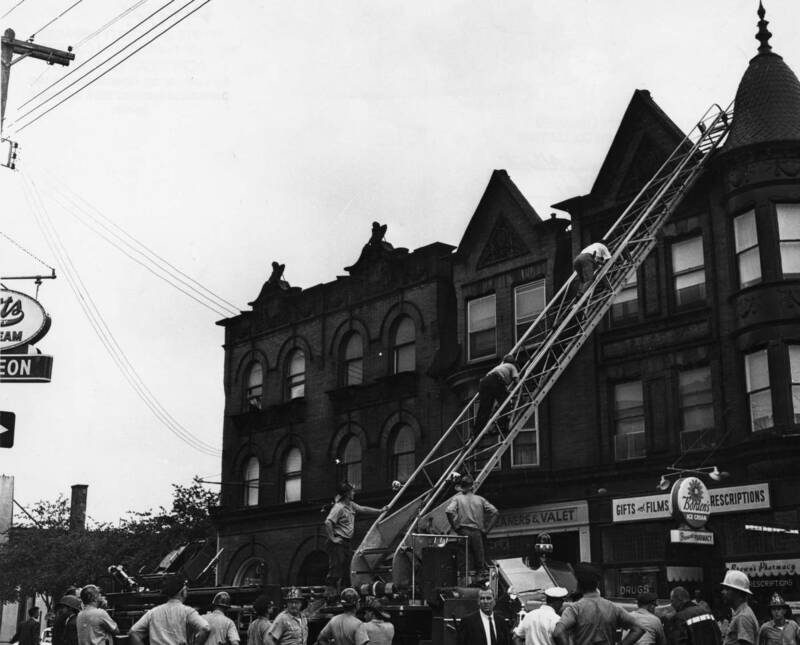 It was amidst this climate of white anxiety about the foreignness and threat of black Muslims that the Columbia Avenue riots occurred in August 1964. In the immediate aftermath, many people, including prominent civil rights leaders, charged that the riots were the work of black militants and black Muslims. During the investigation that followed, officials uncovered little organized agitation on the part of Communists, New York Muslims, or other national groups, but determined that several local black militants and Muslims were involved. Ultimately, three individuals were charged with inciting the North Philadelphia riots, Shaykh Muhammad Hassan, also known as Abyssinia Hayes, Raymond Hall, and Florence Mobley. Of those charged, Hassan was the most prominent. After being asked to leave a national black Muslim group for being too radical, Hassan founded the National Muslim Improvement Association of America (NMIAA), whose temple and headquarters were located at 2338 W. Columbia Avenue in the heart of the riot activity. Hassan was also a businessman in the mold of the independent black economy, operating a dry cleaning business, (Shabazz Cleaners at 2340 W. Columbia Avenue) and a candy and cigarette store (Casbah on Columbia Avenue near 23rd Street), as well as the Asian-African Cultural Center at 2336 W. Columbia Avenue. On the night of August 28, 1964, many witnesses stated that they saw Hassan making announcements on a megaphone, but accounts conflict as to whether he was quelling or inciting the crowd. 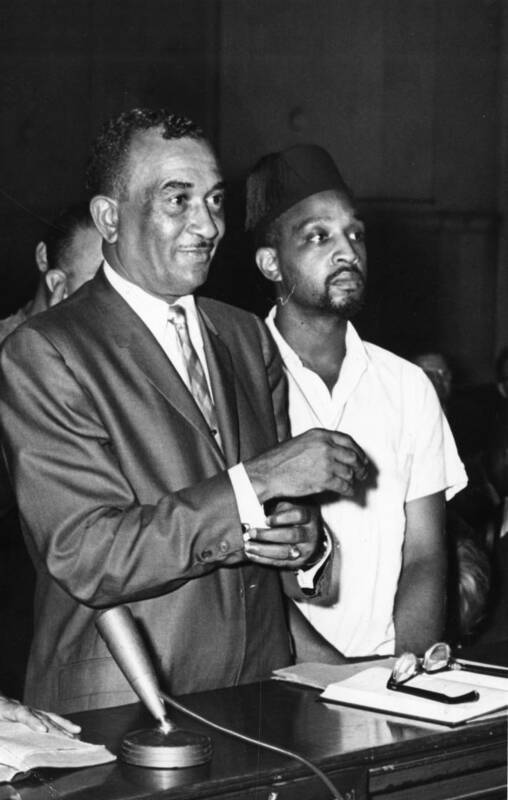 Hassan maintained that he was telling people to remain calm and get off the streets, and one witness later testified to that effect, but others recalled Hassan leading a chant of “we want freedom, we want justice; let’s get these people away from the police,” as he moved through the crowd, according to a Philadelphia Evening Bulletin article from September 15, 1964. During this call, the first projectiles were thrown and windows broken. While Hassan admitted to leading the chant, he claimed that he intended to distract the crowd from interacting negatively with the police and an officer later testified that Hassan told him that he was the leader of the people in the area. Significantly, upon a previous arrest, Hassan told investigators that he was the leader of a movement advocating total separation of white and black races without animosity, but when police raided the NMIAA temple during the riots, they discovered weaponry and what they believed to be materials to prepare Molotov cocktails. During the raid, Hassan’s premises were ransacked and some of his property ruined and he was also beaten by police during the rioting. Hassan was charged with riot, inciting to riot, and riotous destruction of property and during his trial wore traditional Muslim garb, much to the chagrin of the presiding judge. On November 11, 1964, he was found guilty of riot and inciting to riot, but acquitted of riotous destruction of property by an all-white jury. Hassan was sentenced to a jail term of eighteen months to three years, with two years probation after his release and a $1,000 fine. His request for a new trial on the basis that insufficient evidence supported his convictions was ultimately denied. A member of Hassan’s NMIAA, Raymond Hall, also known as Yusef Abdullah, was arrested as well and charged with conspiracy, riot, and riotous destruction of property. At trial, witnesses testified that they heard Hall using vulgar language to condemn the police and religious leaders, as well as encourage the crowd to riot. Cast as a neighborhood agitator, Hall was credited with starting the rumor that a pregnant woman had been beaten to death by the police, which helped spark the riots. Hall denied all charges and claimed to be too scared to say anything against the police, though he admitted to having a brief spat with some ministers who he accused of picking on him instead of attempting to quell the chaos. After Hall waived his right to a jury trial, a judge convicted him of inciting to riot, but acquitted him of conspiracy and riotous destruction of property. The judge then requested a pre-sentencing investigation to determine whether Hall deliberately set out to instigate the riots or if he got carried away in the excitement and, finding that Hall did not start the riots, but encouraged the chaos, sentenced him to three to nine months in jail. While some 600 arrests were made in the aftermath of the Columbia Avenue riots, only one woman, Florence Mobley, was arrested for inciting the riot. In order to make arrests, police used press photographs to identify suspects who participated in the riot and Mobley was photographed yelling to the crowd while standing atop an upended refrigerator. 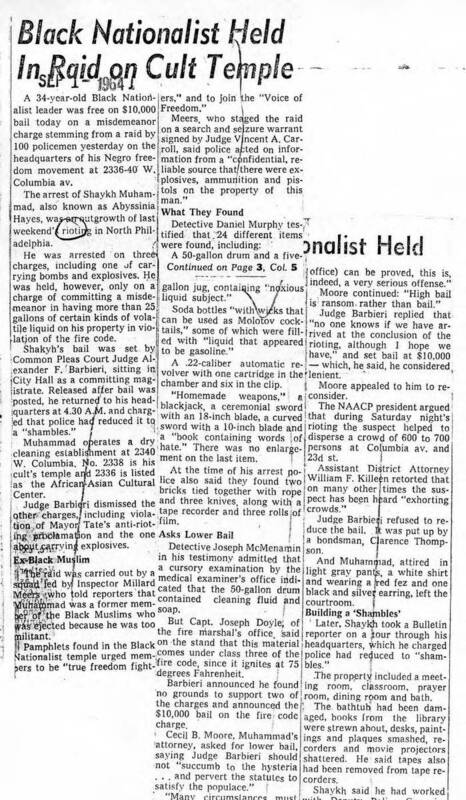 As recounted in a Philadelphia Evening Bulletin article from September 17, 1964, witnesses asserted that Mobley told the crowd “we don’t need the NAACP; we don’t need civil rights; and we don’t need Cecil Moore. There are enough of you out here to kill all the...cops” and a clergyman testified that she used abusive language towards the police. Mobley was later carried upon the shoulders of the crowd and continued her diatribe against the current conditions in society and police brutality from a sound truck before Cecil B. Moore removed the microphone from her hand. 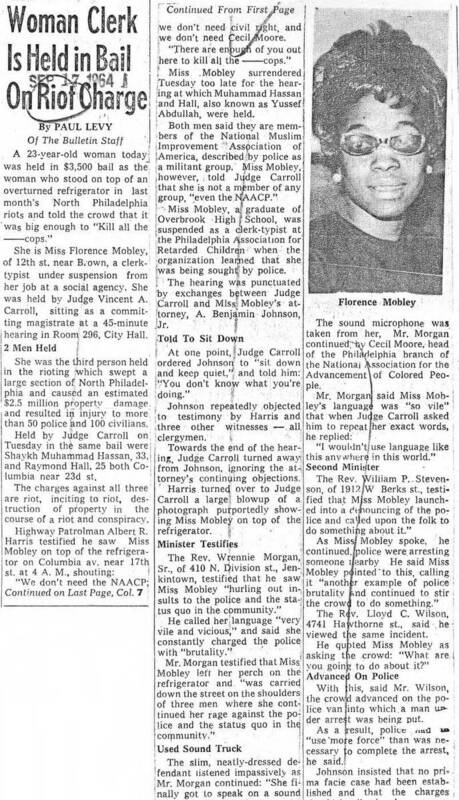 As police attempted to make arrests, Mobley cried out against police brutality and asked the crowd “what are you going to do about it?” before being arrested herself according to the Philadelphia Evening Bulletin of September 17, 1964. Mobley claimed no allegiance to any political or religious group and did not ascribe to any particular philosophy and her lawyer defended her actions as free speech. As Mobley’s trial progressed, she changed her plea to guilty in December 1964 and the presiding judge subsequently ruled that Mobley, who had been in jail since September, had served enough time and suspended her sentence. In the end, no coordinated effort between Hassan, Hall, and Mobley was ever proven and, while their actions fed the chaos, the summer of 1964 witnessed many race-related riots across the country, not just in Philadelphia. While not all rioters were Muslim, black American Muslim philosophies played a part in the events, as did the desire for quicker progress on civil rights. As faith in black nationalism and militancy increased, such advancements sparked uncertainty and distrust in the white community and resulted in an extraordinarily complex scene of riots and violence that drastically changed race relations in America. To view primary source materials about black militants and other topics in Philadelphia's civil rights history, search our collections. “Race Relations--Columbia Ave. (1).” Folder 043, box 61, Mss. 155. Jewish Community Relations Council records. Urban Archives, Temple University Libraries, Philadelphia, PA.
“Riots--Miscellaneous--1964 August” folder. George D. McDowell Philadelphia Evening Bulletin newspaper clipping collection, Urban Archives, Temple University Libraries, Philadelphia, PA.